The first buses have left Stockholm, taking stranded Bulgarian berry pickers home. They have endured poor living conditions in camping sites in the Uppland forest, and even took to camping outside the Bulgarian embassy in Stockholm, but are now being transported back to Bulgaria. The transport is being funded by the Bulgarian government. Critics here now question who is responsible for European workers lured to Sweden to pick berries. The Swedish government has responded to calls for greater oversight. The government now wants recruitment and personnel agencies based outside Sweden to register the number of workers with the Swedish Work Environment Authority. "It will contribute to greater transparency on the labour market and increase the authorities' ability to safeguard working conditions," Employment Minister Hillevi Engström writes in an email to the TT news agency. 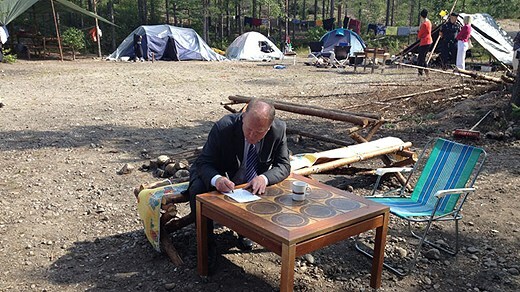 TT notes that not all workers are directly employed by the recruitment firms and have instead been lured here by vague promises of plentiful work in the Swedish forests. There are at present no estimates of how many stranded workers there are in Sweden. Note: I saw on the Swedish TV news yesterday that 3 busses were leaving from Stockholn in the evening. This is a positive occurance and I'm happy for the Bulgarian workers. This is the 3rd annual event of luring foreigners to Sweden and then Swedish companies cheating them using foreign employment agencies. This is a common practice and one used to get around the Swedish laws. There has been much talk of regulation and proposals by high level politicians for three years, but still the problem continues without any resolution and in fact has worsened.